The latest joke among the Mahadeo Koli tribals living in the Bhimashankar area of Maharashtra’s Pune district is: “Ovni zali ka? (Have you transplanted your paddy? )” In the rain drenched Sahyadri range, where the main food crop is paddy, the unseasonal rains brought on by cyclone Phyan in late November have caused the harvested crop of fragrant Raibhog paddy to sprout shoots. 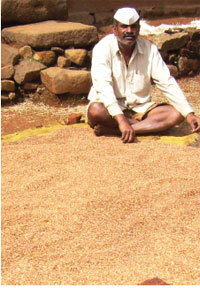 This has made crops in entire villages unfit as food or seed. With starvation and loss of seed stock staring in the face, people can do little but joke about the calamity. As elsewhere, changing weather conditions wreaking havoc on farmers is nothing new. What is, is the fact that for the last 20-odd years, residents of some 10 villages of Kolis in the western hills of the Ambegaon tehsil have been documenting the changes in climatic conditions and their impact. With the help of the non-profit Shashwat, tribals of these villages have learnt to note their observations using terms like climate change; they say such terms are necessary to make sense of their predicament. “Till about the 1970s, the rainfall pattern in the area could be predicted like clockwork,” said Dhondabai Asawle, the 80-plus matriarch, revered both for her deep knowledge of weather phenomena and her ability to articulate her observations in city language. “We planned our agricultural activities around the time-table of nakshatras (stars). And till I was in my 40s, I do not remember the timetable ever failing us.” The 27 nakshatras in Vedic astrometeorology indicate the overall weather pattern for the year. pattern started changing, following massive tree-cutting on the hills by coal contractors in the early 1970s. “For almost a decade, these contractors would clear vast tracts of hillsides, and make coal from the wood in large furnaces,” she said. “There were fires burning day and night on the hillsides for several months every year.” The deforestation stopped when in the 1990s, 50 villages backed by Shashwat, waged a struggle to save their devrais—sacred forests. Dhawdaji Gawari of village Pimpargani remembers two things happened immediately after the hills were denuded: “The temperatures went up and strong winds started blowing; both were bad for our crops.” Shortly after that disturbances in the rainfall cycle began to be felt. The community has maintained detailed records of these. 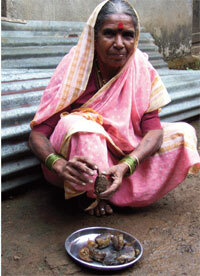 Dhondabai recalled, all through her childhood and youth, millets were sowed on Akshaya Tritiya. This auspicious day in the Vedic calendar falling in April-May came soon after light showers in the Kritika Nakshatra. “Light but regular rains starting with the Rohini Nakshatra followed soon after,” she added. “After the rains started, paddy seedlings were prepared, and transplanted at the onset of the Mruga Nakshatra when the rains intensified.” It was as if the entire rainfall cycle was tailored to the needs of crops, say elders. The stars depicting early rainfall, said Zaoji Gawari, were characterized by light rain, just right for the young seedlings. Then come regular heavy rains needed for the rapid growth of the now strong seedlings, the later stars foretell sporadic rain beneficial to crops at the seed-formation stage. “By Diwali, when the crops were ready for harvest, the rains would disappear altogether, not to return till the next year,” he said. After the deforestation, the pattern began to change, a little at a time. “Every year, the onset of rain was delayed by a day or two. By the second half of the 1980s, the Rohini rains had disappeared almost completely, and we took to sowing at the onset of Mruga,” said Dondabai. Till almost the end of the 1990s, Mruga rains remained more or less stable; then they too began to waver. In the last decade, says Dhondabai’s formally educated son Sanjay, the rains receded rapidly. “In the early part of the decade, the Mruga rains were hardly seen. This year’s phenomenal one month delay in sowing is, to us, nothing but the next stage in an ongoing process of 40 years.” For the last 4-5 years, Dhawdaji said, “the monsoon has been split into two. The rains disappear for weeks, sometimes a whole month, after the initial spell and return later, often continuing into harvest time.” The changing rainfall pattern means the area gets less rain each year. Records of the meteorology department’s Bhimashankar and Dimbhe observatories reinforce what the villagers have noted over the decades. Rainfall has declined by 2,000 mm annually, dropping from 7,000 and 2,500 mm respectively in the early 1990s to 5,000 and 1,500 mm at present. This has led to other changes. “Till about 40 years back, summers were pleasantly warm and winters were very cold. Now we have uncomfortably hot summers and winter comes as late as November-end,” said Goin Pardhi of village Dimbhe. Earlier, winter set in close on the heels of the receding monsoon, but now it gets warm again between monsoon and November, Pardhi added. This second summer is playing havoc with people’s health, giving rise to infectious diseases never seen in the area earlier— especially viral and gastric infections. “Winter has lost its bite as both fog and dew have decreased progressively,” Dondabai said.